With TED talks booming in popularity, it can be hard to catch a ticket before they sell out. In keeping with the TED motto of sharing ideas worth spreading, live mind mapping provides a simple, visual and shareable format to present key ideas and quotes from the talk to those unable to attend or to archive the talks. TEDx enthusiasts who miss out will often want to hear about the talks as soon as possible: live mind mapping fills this gap by sharing the talks with those unable to attend, in real time, or straight after. 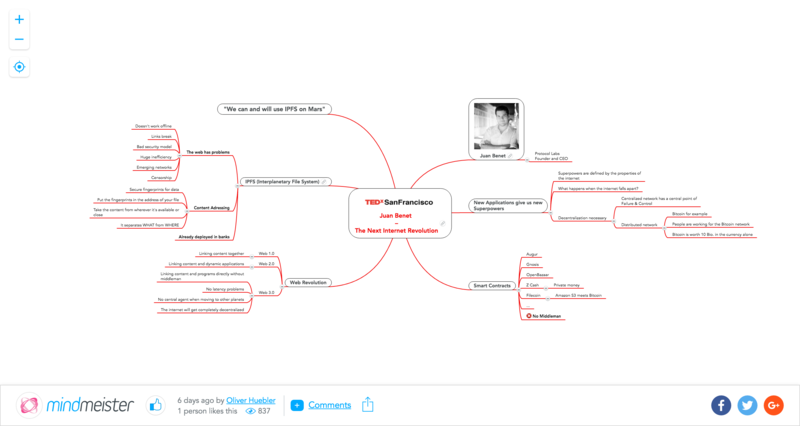 Mind maps produced live from TED talks can be shared over twitter via the event hashtag or broadcast over a live mind map stream, allowing all TED fans at home, in the office, or wherever to watch the streamed live mind mapping session online. The mind mapping process enables viewers to not only access the knowledge shared but understand and retain the content of the talks better. Mind mapping as a visual learning technique has been found to stimulate and integrate both the linear, convergent left-side of the brain with the divergent, non-linear right-side of the brain, enabling viewers to comprehend concepts more easily, while improving information retainment by 10-15%. 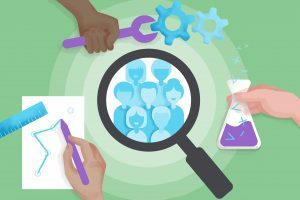 The fact that you also have the talk summarized and published in one public, online format makes the mind map a useful reference to TED fans and online researchers alike. Before the talks begin, create a folder in MindMeister and name it after the TED event title. Look up the sessions and speakers ahead of the day and create a blank mind map for each talk, including the title of the talk in the center. Add your first topic (or branch) including details of the speaker, a photo and their twitter handle, to each map in advance. When the talk begins you can open your prepared mind map to take notes, starting beneath your existing first branch on the speaker’s details and going clockwise around the center. 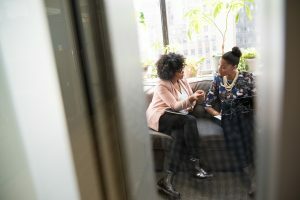 Don’t try to transcribe the speaker, the aim is to create a visual summary of the key takeaways that would make sense to someone who hasn’t watched the talk in full. 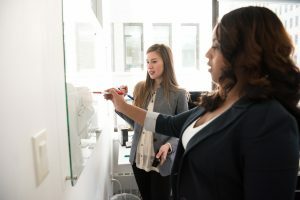 Use keywords and short phrases which you feel provide the essence of the talk – you can always include more detailed notes in the note section of the topic. To emphasize certain parts of the map, use varying icons, colors and font sizes to highlight, number and group ideas. 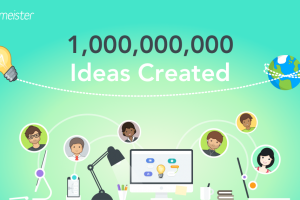 You can attach images to the topics either from the MindMeister library, from your computer, via MindMeister’s WunderBild feature which matches an image from Google, or by simply pasting from your browser. For a how-to-guide on how to create a mind map from a TED talk video, read our post on Taking More Effective Notes Using MindMeister. 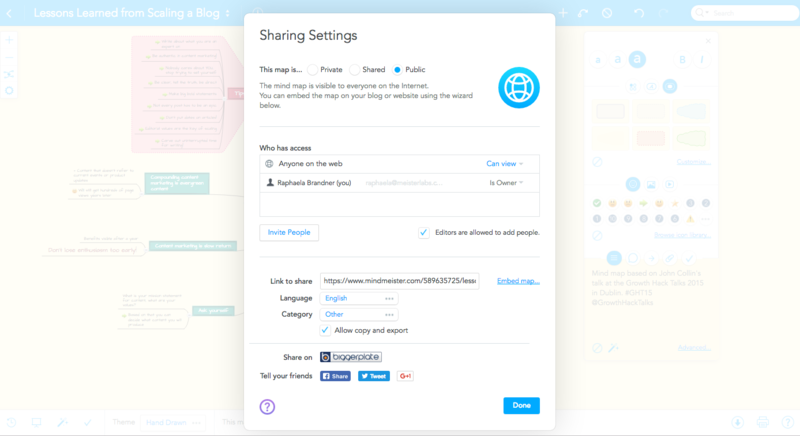 Once you’ve created your mind map, make the map public via the sharing settings, where you can also add the map to the Biggerplate library to gain more exposure. While at the TEDx event, the best way to gain exposure is to tweet your map using the event hashtag. Via the sharing settings on your mind map you can find a shareable link to your public map, which you can then paste directly into a tweet, along with the event hashtag. Remember to tag in the speaker too, so that they can retweet the summary. Sharing a public map to Twitter automatically attaches a preview image of the mind map to the tweet, including the map description, giving the hashtag followers even more reason to engage. 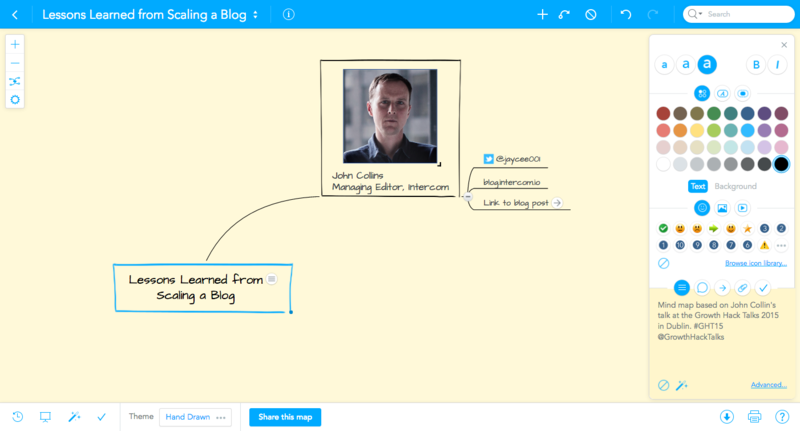 To edit the map description which appears in the preview, open the mind map properties dialogue via the information symbol in the MindMeister top bar and edit the description to include an overview of the talk. 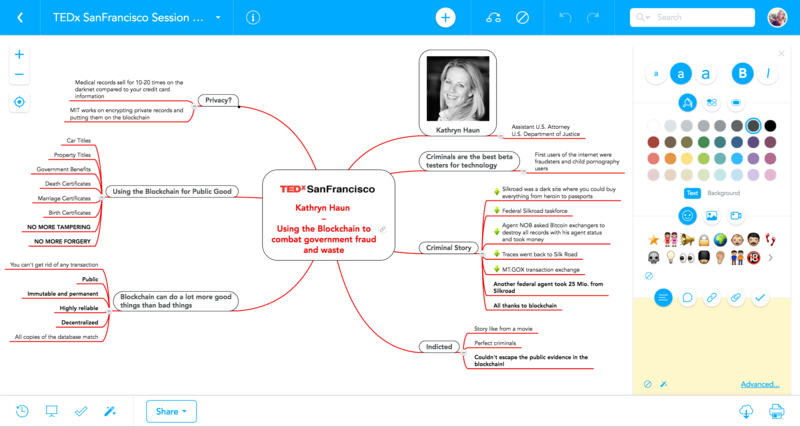 We’ve developed a bit of a tradition here at MindMeister of attending all the TED and TEDx talks we’re able to and mind mapping the inspiring talks. So, when MindMeister’s COO Oliver Huebler heard about the upcoming TEDx event in his new hometown of San Francisco, he jumped at the chance of attending. The TEDx San Francisco Dare to Know event focused on how data can be harnessed to lead society within the realms of medicine, entrepreneurship and the blockchain. Each speaker gave their two cents on whether we now have the power to, in the words of TEDx SF, replace the philosophy of need with the philosophy of want. Oliver live mind mapped 23 of the talks given, including a talk from Juan Batiz-Benet speaking about The Next Internet Revolution, covering how we can and will use IPFS (Interplanetary File System) on Mars. 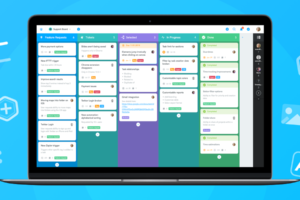 If you’re attending an event which MindMeister are supporting via a live mind mapping service, you can live stream your mind map as you build it, via our website. To do this MindMeister create a specific page for the event, like the page we created last week for TEDx San Francisco, listing live streams of all connected mind maps as they’re made. To get your mind map streamed on the page, simply tag your public map with the designated event tag in order to have them appear live via the event page on our site. 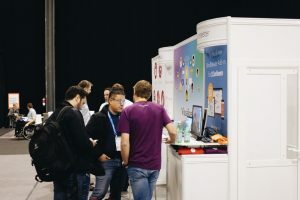 Currently this live streaming service is only available for events which we officially support with an event landing page but we’re considering extending this offer so that MindMeister users are able to live mind map at will, regardless of whether we support the event – let us know whether you’d find that useful in the comments below. So there’s our guide on how to share the knowledge of TED events with those who were unable to attend, by mind mapping talks as and when they happen – as always let us know any thoughts or questions in the comments below. 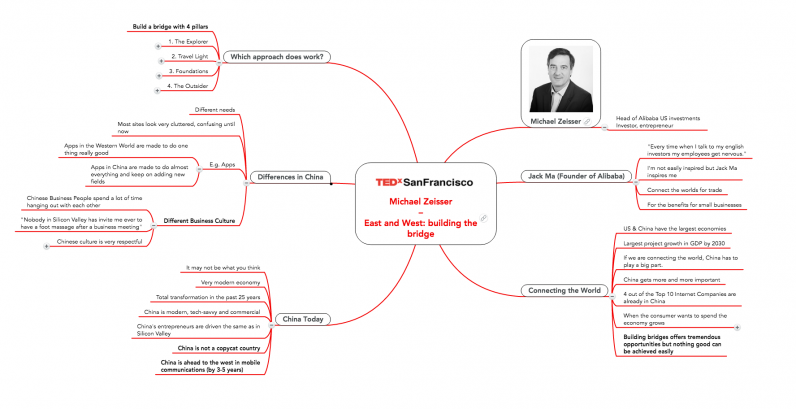 To catch up on what was covered during TEDx San Francisco last week, check out all 23 of the mind maps Oliver created in real time. Thanks for sharing. This is very inspiriting. 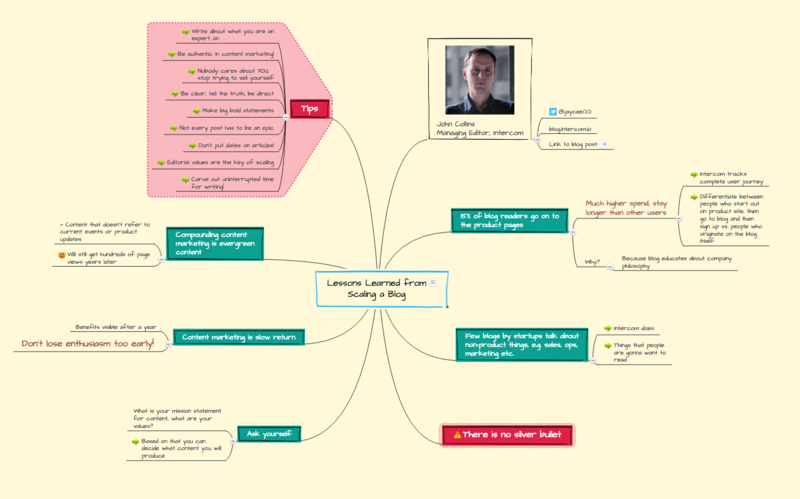 There is another mind map maker called Edraw that I have been using for almost 3 years now. After reading your article, I would definitely try mind map! Hey Lynia, thanks for your comment – it’s lovely to hear you find the article inspiring 🙂 Have you tried using MindMeister for mind mapping since? It would be great to hear how you’re getting on with it, if so! I am interested in live streaming a mind map.